Years ago I worked for an on-line appraisal company where clients sent in pictures and descriptives of items for which they wished professional identification and comments. My area was 19th C and 20th C European and American textiles. 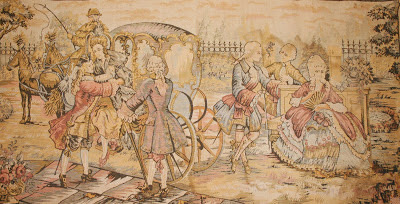 More than ½ of all textiles I viewed were late 19th C, early 20th C European machine-made tapestries. 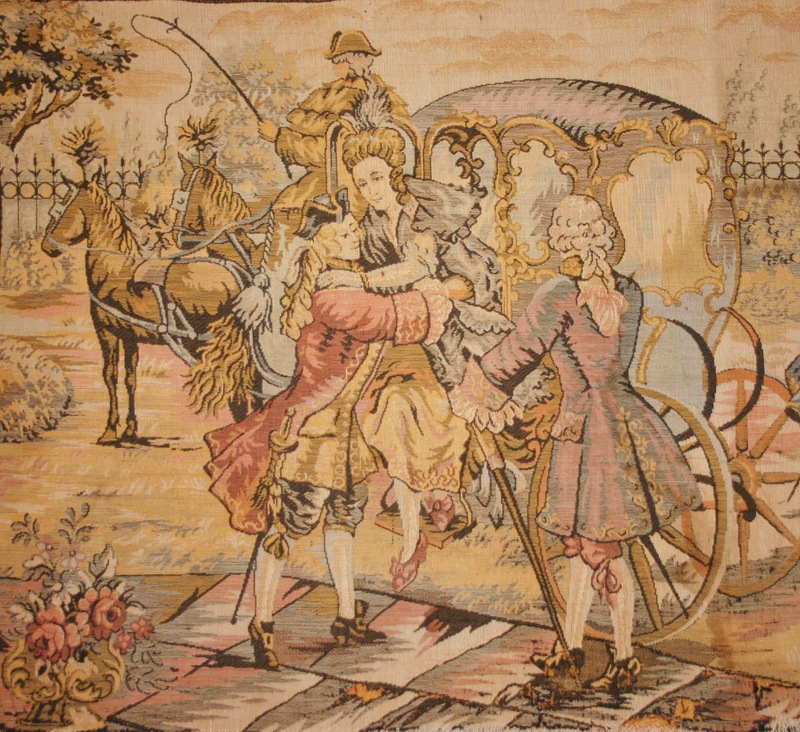 Tapestries have a long textile history. 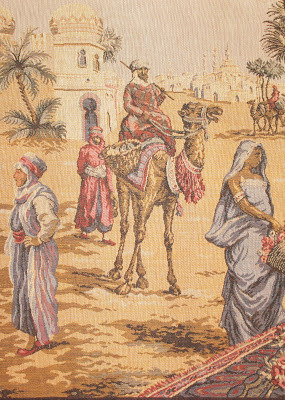 Many world areas created woven pictorial textiles to adorn their interiors. 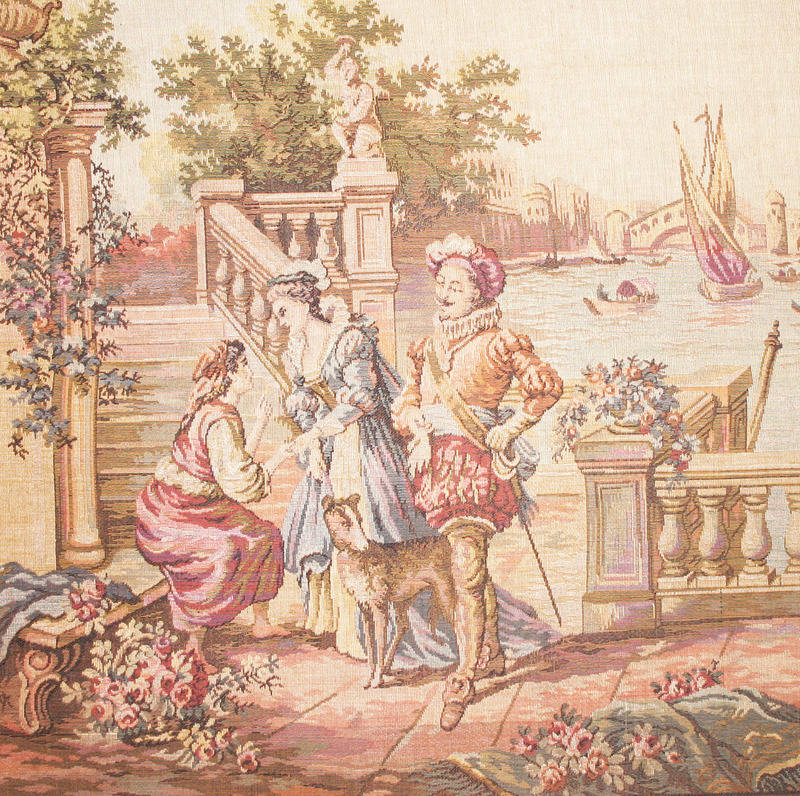 With the invention of the Jacquard loom, intricate patterns could be woven much more quickly than patterned textiles woven entirely by hand. 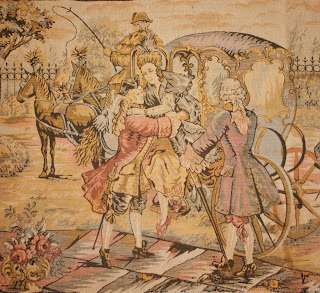 However, there is something very special about the hand-woven tapestries created in workshops by highly trained weavers. These were very large pieces, made to hang on the walls of palaces and manor houses of the wealthy. They could be taken with the household goods and furniture when the family moved from one residence to another. Too often they were altered (by cutting to fit a smaller space) but remaining tapestries offer a view into a world that appreciated a different aesthetic. These textiles were allegorical, depicting mythology as well as religious themes, many showed bucolic, pastoral scenes of peasant life. It comes as no surprise, then, that during the last decades of the 19th C the newly emerging middle class wished to emulate the highly esteemed home furnishings of the past. Many industries, especially the textile industries, were being modernized with efficient machinery that was supposed to closely mimic hand- crafted products. Sometimes they succeeded, sometimes not so much. But they definitely were able to produce modestly priced goods. 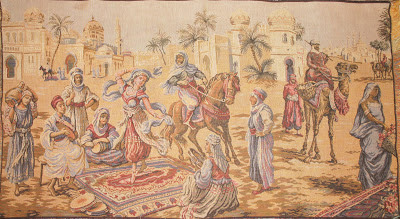 The demand for tapestry-like textiles to drape over furniture pieces, and occasionally hang on the walls resulted in the production of thousands and thousands of small weavings. They also were allegorical. 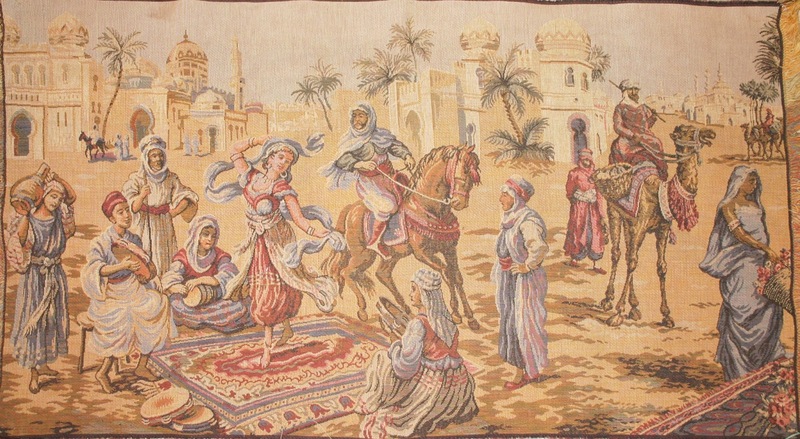 The themes were rural and mythological but in keeping with the great interest in foreign travel (especially in the Middle East and North Africa) many featured scenes of exotic lands as well as century-old European life. How can one identify these textiles? 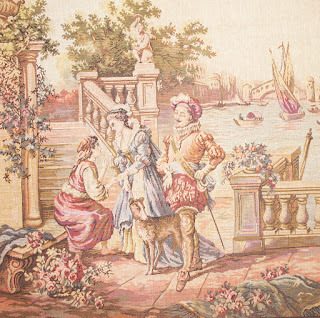 Hand-woven tapestries, whether antique or modern, have a discontinuous weft, while machine-made textiles have a weft that continues along the reverse of the fabric. At times, some of this continuous weft is trimmed to reduce bulk but this leaves a fuzzy appearance on the reverse. Secondly, the size is much smaller than antique, usually rectangular, to fit over the top surface of furniture (table tops and pianos). Thirdly, the color of these newer textiles is much softer, with a grayed background (suggesting age?) and a more pastel palette. There are still many of these textiles to be found in thrift and antique shops. While many may have faded and damaged areas they are perfect for pillows. Imagine a bookcase lined with some of these samples or used as matting for vintage photographs. I was wondering if you have any info on the first and the second piece that's posted on the article. Such as the company that made it etc? My grandmother has had this piece hanging on her wall since I was a baby but we know nothing of it.